General Tips for Healthy Dining Out! 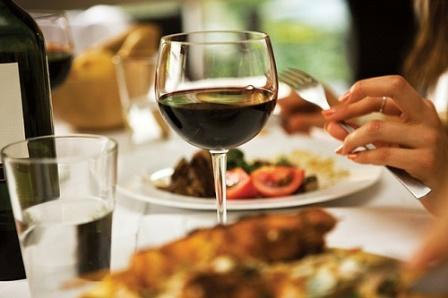 Whether or not you’re trying to lose weight, you can eat healthy when dining out or bringing in food, if you know how. The following tips will help you move toward healthier eating as you limit your calories, as wel as fat, saturated fat, cholesterol, and sodium when eating out. Ask for what you want! Most restaurants will honor your requests. Ask questions! 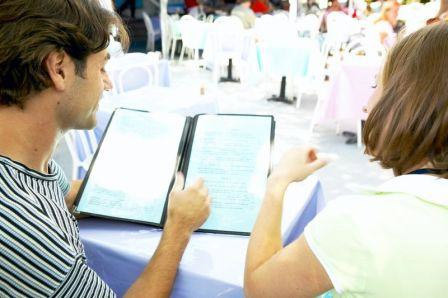 Dont’ be intimidated by the menu – your server will be able to tell you how foods are prepared or suggest substitutions on the menu. If you wish to reduce portion sizes – try ordering appetizers as your main meal. General Tips: Limiting your calories and fat can be easy as long as you know what to order. Try asking these questions when you call ahead or before you order. Serve margarine (rather than butter) with the meal? Serve fat-free (skim) milk rather than whole milk or cream? Use less oil when cooking? Trim visible fat off poultry or meat? Leave all butter, gravy, or sauces off a side dish or entree? Serve salad dressing on the side? Accommodate, special requests if made in advance by telephone or in person? Above all else, dont’ get discouraged. There are usually several healthy choices to choose from at most restaurants. Look for terms like steamed, in its own juice (au jus), garden fresh, broiled, baked, roasted, poached, tomato juice, dry boiled (in wine or lemon juice), and lightly sauteed or stir-fried. Be aware of foods high in calories, fat, and saturated fat. Watch out for terms like butter sauce, fried, crispy, creamed, in cream or cheese sauce, au gratin, au fromage, escalloped, parmesan, hollandaise, bernaise, marinated (in oil), stewed, basted, sauteed, stir fried, casserole, hash, frime, pot pie and pastry crust.